We are required to supply 5 parents to help as officials with long jump, turbo javelin, and the track races- You can learn on the Job!! We are required to supply 5 parents to help as officials with long jump, turbo javelin, and the track races. You can learn on the Job!! Hosted by Roscommon County Athletics Board. This is 8th year for Longford AC to take part in this event. We are required to supply 5- 6 parents to help as officials with long jump, turbo javelin, and the track races- You can learn on the Job!! Closing Date: Saturday 20th April. Strictly no late entries. Email longfordac@gmail.com with child’s name, their date of birth and parent’s contact info. Please indicate if you will volunteer as an official. €5 will be collected at AIT on the morning of the competition. Last year Longford AC hosted the County Primary Schools’ Relays Competition to encourage young children to engage in a healthy outdoor event while competing as part of a school team. Over 450 children from 16 different schools throughout the county participated. The event took place on a Friday evening and despite the number of participants it concluded in less than ninety minutes. The event this year will be hosted by Longford AC in Clonguish GAA Grounds in Newtownforbes on Friday May 10th. Registration will begin at 5:45pm with the first race at 6.30pm. Last year some teachers attended with their schools while other schools arranged for parents to organise the pupils on the night. Second class to sixth class inclusive can enter teams. Each team must consist of 4 athletes and up to 3 subs. There will be a race for all the subs over the same distance as one leg of the relay i.e. 2nd class girls subs will run a 200m race immediately after the 2nd class girls’ race. Athletes can move up a class to complete a team i.e. a fifth class pupil can run on a 6th class team. Schools can enter a maximum of two teams per class and the registration fee is €2 per athlete. Schools must complete the attached registration form and bring it along on the evening with the registration fee. A teacher or parent can bring the registration form to the clubhouse and they will be issued with a race number for each team entered. 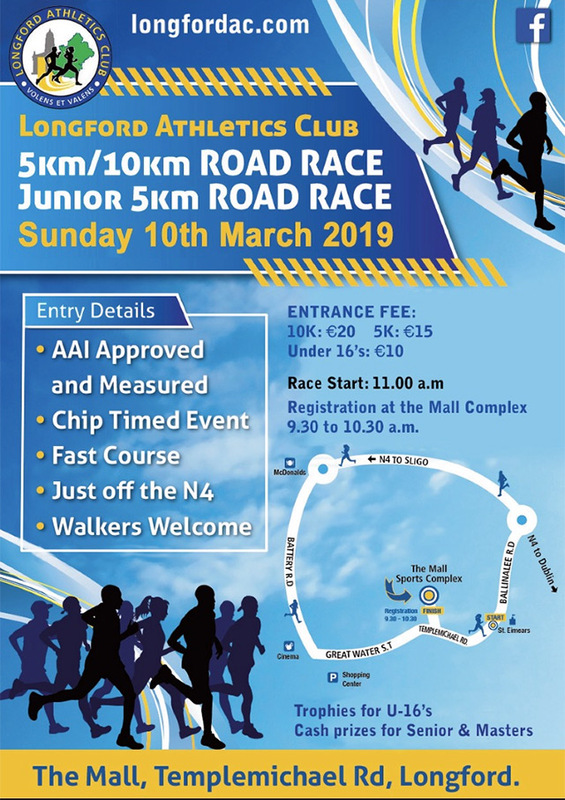 Longford AC are holding their popular 5 & 10K road race on Sunday March 10th 2019 from the Mall complex. Online Entry Now Open or people can register in person that morning just before the race. Entry Deadline 5pm Friday February 15th. NO late entries will be accepted. Email entry to longfordac@gmail.com with child’s name, Date of Birth, contact phone number and the exact events you want to enter. Entry fee €5 per event will be collected at training on Wed Feb 13 from secondary school group\Friday Feb 15 from juvenile group. The Club will cover the cost of relay teams. Day 1 information: arrive at AIT indoor track at 9:15am, estimated to finish at 4pm. The 1st events start at 10am sharp. Bring snacks, drinks and lunch. NO drinking coffee\tea or eating is allowed inside the arena but there will be tables set up in the entrance area where you can sit to eat. The AIT canteen will be open. Children must wear blue Longford AC singlet (available to purchase €25) white shorts and white socks. If you do not want to purchase a singlet then it is Connacht rule that child must wear plain white shirt. The top 4 from Connacht (except only top 3 in 600m\800m and relay teams) qualify for National Juvenile Indoor Championships on 30th & 31st March and 6th April 2019 at AIT. From what I understand every result is based on the heat times, it doesn’t look like they run a semifinal\final be sure to do your best in your heat! The 4th Annual NORTH WEST INDOOR GAMES takes place on Saturday December 29th, 2018 at AIT Indoor Arena. All Clubs in Connacht have been invited to take part. Please open document to see more details. All entries must be submitted and paid to organising County next week. They will NOT accept any late entry or no entries on the day. Deadline for Longford AC entries is 5pm on Monday December 10th. The Indoor Track & Field Season starts in January and all children will move up 1 age group on January 1st. All children Born in 2008 will be U12 for all competitions in 2019. This competition on Dec 29th is optional and is a pre-season warm up! If your child is interested to compete please email longfordac@gmail.com with child’s name, date of birth and events they want to enter (maximum is 3 events).